Just this month Saudi Aramco announced that production had begun at their Manifa oilfield, and by July would be supplying up to 500 kbd to the new refinery that is being built at Jamail with the collaboration of Total. The first oil from the refinery is expected to ship in August, and both projects are currently ahead of schedule. Manifa will further increase in production next year, to 900 kbd, with the additional flow going to the Yanbu refinery being built with the collaboration of Sinopec. Both these refineries are designed to take heavy crude, and can also accept oil from the ongoing projects to expand production at Safaniya. Collectively this is said to ensure that the company will be able to achieve a maximum sustainable production of 12 mbd. The gains in available reserves are required as the current production from Ghawar and the other major fields in the Kingdom continue to decline in production, as was discussed last year. I remain relatively convinced that Saudi Aramco will not increase their crude oil production above 10 mbd, despite the wishes and projections of others that they will end up doing so. By the time that their domestic consumption reaches the point that it lowers exports to a level that would hurt the KSA economy at current prices, the shortages globally will have raised the price sufficiently that the available production at that time will continue to suffice to meet their needs. (This is, however, a projection only for this decade). 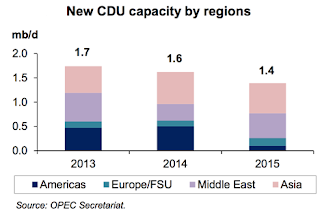 This month’s OPEC Monthly Oil Market Report continues to anticipate a significant increase in available crude over the next three years, although this is indirectly recognized through the growth in crude distillation unit (CDU) capacity around the globe in that interval. Given that the world must increasingly deal with a heavier crude supply, the need for new refineries, as exemplified by the new Saudi construction, is evident. Increased demand to absorb this supply will come, in part, by an increase in the growth rate of the GDP of the BRIC nations, although the poor growth in the developed nations continues to hamper their export markets. Overall demand is still anticipated to increase by around 0.8 mbd, with half of that coming from China and the rest of the non-OECD nations contributing an additional 0.7 mbd, offset by a decline in demand from the OECD nations of around 0.3 mbd, taking global demand, by the end of the year to nearly 91 mbd. Internal demand in the Middle East will continue to sap a fraction of this relative to exports. Overall the Middle East demand is anticipated to increase by 280 kbd, though the impact of the turbulence in various nations is hard to estimate. Virtually all the growth in supply is anticipated to come from North America, with a slight increase in production from South America coming from Colombia and Brazil. 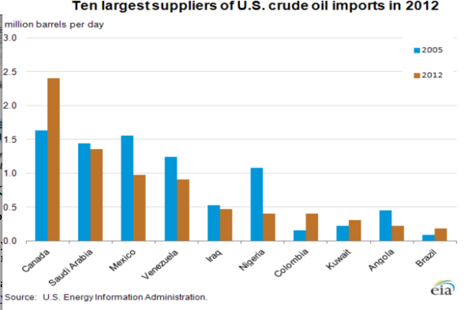 There is some concern, however, over the impact of attacks on the energy structure in Colombia. The expected growth in 2013 is supported by the anticipated supply increase from shale oil plays in North Dakota and Texas, as well as by minor growth from other areas in Oklahoma, Kansas, Colorado and Wyoming. The infrastructure situation is improving in North Dakota, with reports suggesting that the railroad loading capacity will reach 1 mb/d. 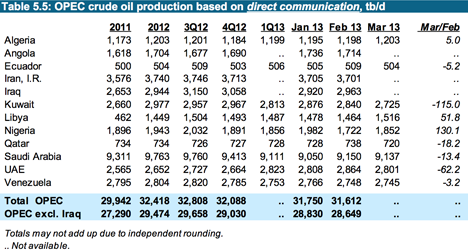 Eagle Ford oil production in January continued to increase from the same period a year earlier. On a quarterly basis, US supply is expected to average 10.57 mb/d, 10.62 mb/d, 10.56 mb/d and 10.55 mb/d respectively. Canada is expected to reach a production total of 4 mbd by the end of the year, with the largest impact coming from the Kearl Oil Sands production anticipated to bring 110 kbd to market in the third quarter. (This is not dependent on the Keystone pipeline.) Mexico will see a slight decline in production though the Kambesah field (at 13.7 kbd) and increased production from Tsimin will offset most of that. OPEC is anticipating that Norwegian production will fall 110 kbd this year, with a small decline of 40 kbd in UK production. 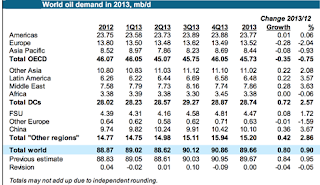 OPEC expects that Russian production will increase to average 10.43 mbd in 2013, slightly down from first quarter numbers, while, in anticipation of Kashagan production, OPEC expects Kazakhstan to increase production to 1.67 mbd. The decline in production from the Azeri-Chirag-Guneshli field is expected to cause a slight ( 50 kbd) reduction in Azerbaijan production. 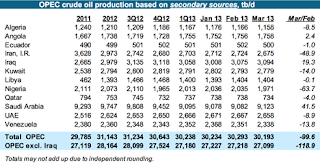 There is, as previously, some difference between the production that the individual nations of OPEC report each month and that reported by secondary sources. In short, over the course of this year OPEC remains relatively complacent that North American production gains will continue to meet the global demand, and that OPEC (i.e. 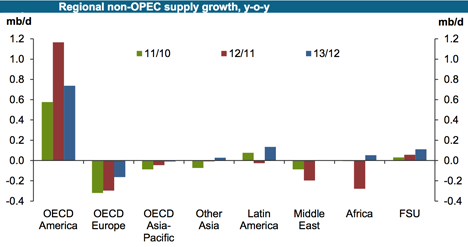 largely the KSA) can back away from full production in order to balance supply and demand at a price level that keeps the OPEC bankers happy. Back in March the EIA TWIP noted the change over the years, not only in amounts, but also in the sources of US imports, which remain significant. There has been quite a bit of change since 2005, when imports were at their highest level (10.1 mbd). 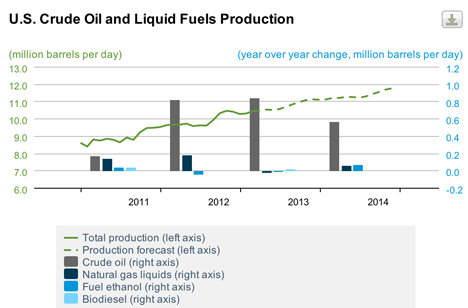 The EIA anticipates that US liquid fuels consumption will remain sensibly stable through the end of 2014, ending that year at 18.61 mbd. 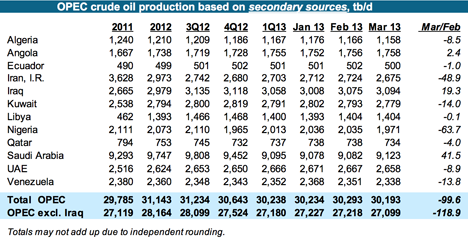 At this time production is expected to rise to 11.75 mbd. In that interval they anticipate that the price of gasoline in the United States will slowly decline. In contrast with the reports by the major oil companies that were discussed recently, these forecasts are short enough that it will be fairly quickly evident how accurate they are.